I run a script regularly on my computer that prepares all the configuration. It also reinstalls grub. But recently, it occasionally has a problem with lvm and that causes the machine, which is virtual, to get stuck at the grub screen unable to find the kernel. Grub will get stuck and not be able to find the kernel. /dev/sda1: LABEL="boot" UUID="2149e6d9-3d79-492d-9d6f-db6b952852a5" TYPE="ext2" PARTUUID="4f090ca0-01"
This post still confuses me. /boot not being mounted has nothing to do with grub. Grub uses its own abstraction layer to read grub.cfg which points it to a initrd/kernel. This "abstraction layer" never "mounts" anything, grub has no knowledge of mounts. So only your grub.cfg could be wrong, or not written because you didn't manually mount /boot, but pretty sure boot-update automounts /boot so grub-mkconfig can write grub.cfg unless specified to not automount. Now that you have concisely written down the steps you were doing and what you expected vs. what was happening, I do not see this as a bug but expected behavior. Grub-install indeed needs a mounted /boot or passed another writeable directory with the —boot-directory argument. This is done one single time only during your initial install. ( it writes a few files, notably grub.env and device.map ) You should not have to run grub-install again unless you corrupted something or another OS etc overwrites it. You then can run boot-update. It seems you are doing these steps in the wrong order. The install page documents these steps in the correct order. Boot should not need to be mounted for a working startup. The only thing that should need ran again is boot-update when you change kernels etc, never a grub-install. /etc/fstab is configured to mount /dev/sda1 on /boot, but it's ignored. Why is it ignored? Anyway, when /boot is not mounted, these errors occur and grub ends up being confused about where the kernel/initramfs are. real_root=/dev/mapper/root (exact one on your box). I'm not sure what problem your answer is trying to address, 1) grub tripping up when it's installed and /boot isn't mounted, or 2) why /boot doesn't mount at boot time. On other systems without LVM, there isn't either problem. You certainly don't need the --disklabel argument or an actual root passed. /boot is never mounted at boot time. Rest of problem is unclear for me out of description. There will be some fixes in genkernel regarding LVM, which may (or may not) fix this particular one. I don't understand what you mean that /boot is never mounted at boot time. I have a bunch of funtoo machines and when they startup, /boot is mounted. Only on the machine with lvm does it not mount. The original problem was that on the lvm machine, the /etc/fstab entry for mounting /boot is being ignored. Installing grub with /boot not mounted results in those LVM errors and grub being unable to load the kernel. Manually mounting /boot seems to fix this problem. Grub reports: Installation finished. No error reported. paste screenshot of grub error upon boot. There is no error as you can see. It just seems that grub can't find the kernel on /boot. it looks you don't have /boot/grub/grub.cfg generated, do you? It seems to make sense that in order to run boot-update, /boot must be mounted. How else would save the grub.cfg file? But does grub installation require access to the grub.cfg file at the precise time it's being installed? If there the answer is no, then there is a bug in the installation of grub. However, either way, it shouldn't be complaining about LVM. If the answer is yes, then the only bug is that utilizing LVM blocks the mount of /boot in /etc/fstab at boot time. This log is from the boot where grub is working and /boot is not being mounted. Here it is again with verbose logging turned on. I don't see any reference to attempting to mount /boot specifically. try rebuilding openrc, when that doesn't help, then I don't know. Not exactly. There are two scenarios, running the grub installation and /boot mounted and one where it’s not mounted. 1) grub will report bogus LVM warnings and no actual error. 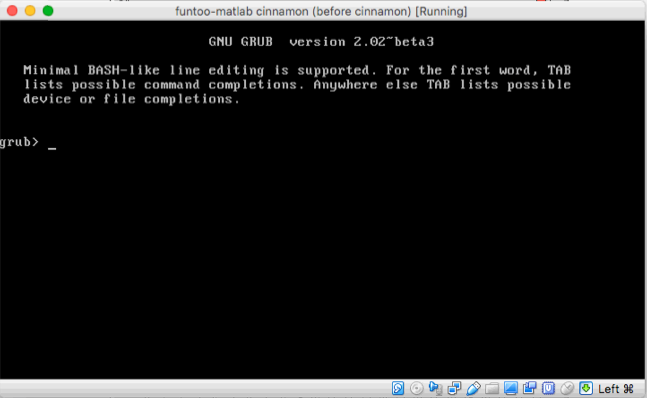 2) At the subsequent startup, grub will not find the kernel and get stuck at the grub command prompt. To reproduce all this, did you create a disk formatted to follow what you see in blkid? I believe this exact configuration is critical to reproducing these bugs. this is my setup, using labels. 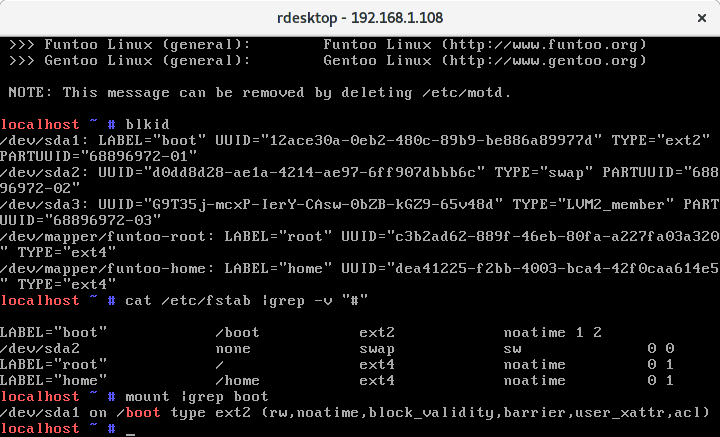 separate /boot, noauto is not set in fstab, boot gets mounted by openrc. still unable to reproduce. And that has no effect. /boot doesn't get mounted. so if you have the whole time noauto there it just won't get mounted, because that is how it is designed. I don't know where that fstab came from, but somehow that fixed the other fstab and now it started mounting /boot. Very weird indeed.